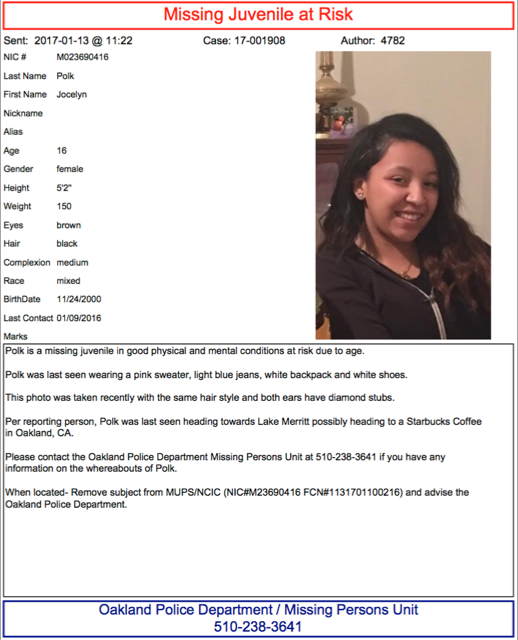 Police are asking the public for help locating a teenage girl that went missing Monday in Oakland. According to police, 16-year-old Jocelyn Polk was last seen wearing a pink sweater, light blue jeans, white shoes and white backpack heading towards Lake Merritt. She is five feet two inches tall, 150 pounds with black hair and brown eyes. Police said she might have been headed towards a Starbucks in the area.